We have music that we play in the room that just calms the whole environment. It is piano music from a radio station on spotify. I was just sitting down to write this post and wasnt sure what to title it and the song Amazing Grace came on. I was holding Sutton in my arms. She was a little fussy, so I began to sing to her. She calmed down and I began to think about the song. “How precious did that Grace appear…” Very precious I thought to myself. She is more precious to us than words can describe. When you meet her, she will touch your heart as she has so many people already. I try to fathom how she is able to stand all of the uncomfortable treatments and end with a smile on her face. It’s almost like she is telling us she understands and forgives us. She is precious to all who encounter her. We have had a rough few days of ups and downs. She seemed to be under control, getting better, but then we have another difficulty show up. We went through a spell of vomiting where she would eat, a small amount, and then moments later start a coughing fit and up it comes. There was a class of nursing students who were helping out on their first day and she managed to give them a nice coat. From there we changed a few things with her meds and all seemed well, until this morning and them it was all over me. After speaking with the doctor, we decided to have speech therapy come in to admire her ability to say her ABCs in four languages…ok…not exactly, but they did determine that she is inhaling a measurable amount of formula when she eats. That was causing her to basically be in a loop where she would clear up and then fluid would get back in her lungs. We are pretty sure it is due to congestion and trying to breathe and eat at the same time. We will know more over the next few weeks for sure. The fix for this problem is a feeding tube. Not fun…but its there. They started the feed tonight and after about 30 min, she was very upset and uncomfortable. We gave her some gas drops and stopped the feeding for a while and she seemed content and fell asleep. They are going to slowly get the feeding tube running again throughout the night. Hopefully she will take better to it as we progress. I have a new appreciation for Moms as they deal with sick little ones. They have a special heart for this. I have been staying with Sutton while Brittany goes to work and it breaks my heart to see her go through this. I wouldnt trade the special time to be here with her and for her for anything though. They are precious moments. How precious does Sutton Grace appear every time we look at her. Thinking of all of you, and praying that Amazing (Sutton) Grace is home and well very, very soon. I love you my sweet Sutty G! You’re a tough little cookie, and I pray you feel better soon. Beautiful post I have been praying all night for her. 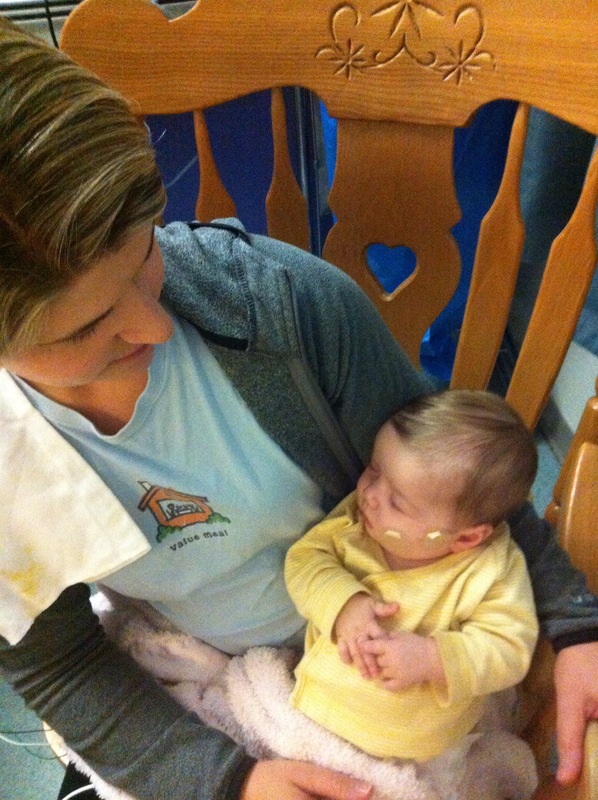 Audrina had to be on 2 reflux meds to help with vomiting after her feeding tube was out. Yes being in the hospital is tough, but they are so safe there and its nice being there to comfort them in these times, you all are doing a great job! What a wonderful post but also what a wonderful father Sutton Grace has! I enjoyed my time with little Sutton so much and yes she really touched my heart!! Please let me help you and enjoy that beautiful baby again real soon!! Love you all! You are ALLAmazing ….I am so proud of how you both are handling all of this….of course we are broken hearted that it ‘s happening to Sutts, and she will not remember it , thankfully. God is blessing you all over and over for your trust in Him. Sending love and prayers everyday! She is so precious! sutton is in the arms of all those that love and care for her she is surrounded by the light from above the trauma she is enduring is to teach each and everyone how blessed we are to have our health and the heart to love such a little angel. Craig and I are thinking of you all, with love.